For the months of June and July, Killer Characters is having a Cozy Reads of Summer Giveaway! Leave a comment and you could win a book, some swag, and more! 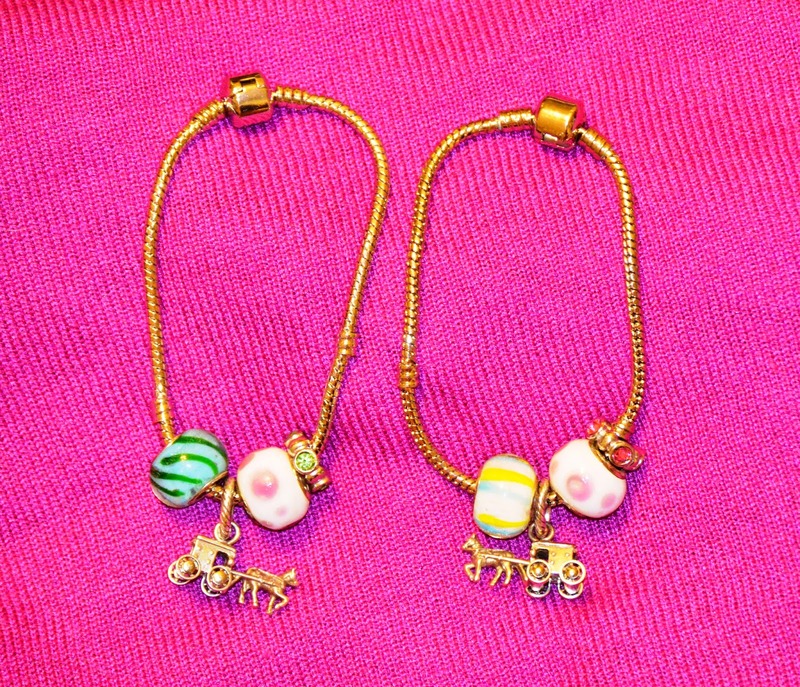 Winners will be selected each day! Actually, I’d say the title for this post “Petunia Unleashed” is a misnomer. The title may make the reader assume that at one time Petunia the Nubian Goat, one of the many interesting personalities that I have contend with in Murder, Simply Stitched, was at one time leashed. It may also make the reader think at one time that Petunia was under control. I'm here to tell you that Petunia has never been under control. Sadly, Isabella does not consult me about titles when it comes to the books or blog posts. You can see Petunia up to no good in Isabella Alan’s latest book about my life in Ohio’s Amish Country coming out TOMORROW (6/3/14)! I'm the central person in this story, who is solving the murder of a township trustee, but I’m not blind to see that the goat gets a lot of page time in this second novel in the series. 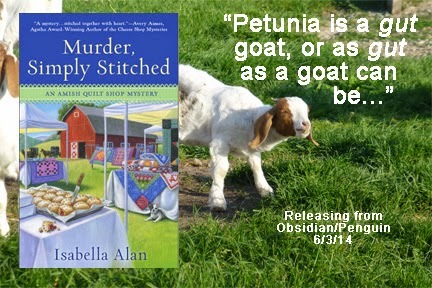 How do you think it makes a crime-solving Amish quilt shop owner feel to be upstaged by a goat? Again, Isabella doesn’t consult me about these things when writing. Regardless, of who the star of the novel is Isabella, Petunia, and I are celebrating its release with a great giveaway. Check it out below! In addition to this giveaway that Isabella is hosting on her website, we're also taking part in COZY READS OF SUMMER! Leave a comment to this post by midnight Today (June 2, 2014) to enter win a signed copy of Murder, Plain and Simple, the first novel in the Amish Quilt Shop Mystery Series! I would love to read "Murder, Plain and Simple" thank you. A series I do not want to miss. I haven't read this series, would love to start. What a great series! Can't wait to read this one! Looking forward to the newest release of this Amish series. I love the introduction of Amish fiction into the cozy mystery genre. I am looking forward to reading "Murder Plain and Simple". I loved the first book in the series, and can't wait to read this one!! I'm always looking for a new series. I love cozy mysteries and Amish novels...this sounds wonderful!! I just love goats--I had 3 as pets when I was a child. Petunia makes this book a must-read for me. I just bought her other series that I'm getting ready to read, I would love to start this one, too. I've heard so many good thing about this series. Thank you so much for the opportunity to win Murder, Simply Stitched! It sounds so interesting, would love to win a copy to read. Thanks for the opportunity! Would absolutely love to win books from this series. I have read a lot of books with cats and/or dogs in them but never one with a goat. Sounds intriguing. Will definitely put this one on my TBR list. This sounds fantastic. Love the cover!! Petunia sounds like quite a character. Perhaps 6th time is charm. Would like to win as all of your books seem like excellent mysteries. Would love to win a new book for a new author. Can't wait to read this series! I would love to win a copy of "Murder, Plain and Simple." It sounds like the beginning of a terrific series. Thanks! First in a new series huh? That's exactly what I look for when it comes to new-to-me-authors of cozy mysteries. I'm also a quilt maker! Thank you for the chance to win this book. Sandy, you are the winner! Please email authoramandaflower@gmail.com with your snail mail address for your book. You have 48 hours claim your prize! Thank you so much Amanda & Killer Characters for this book! I'm looking forward to reading the first in this series. For someone like me who loves quilts - sounds like the perfect mystery. I would love to start reading this series! It sounds really good! Thank you! I loved the first book and can't wait to read about Petunia...and Oliver (sorry Angie). This sounds like a great summer read. I love reading Amish and I love mysteries to. Perfect combination! Sounds like a fun series for the summer! Thanks for the chance to win! I live in Ohio not too far away from Amish country. I love reading your books. Thank you for this opportunity! I am keeping my fingers crossed. Looking forward to reading this book, would love to win it! And so it goes...another wonderful new series to add to my growing TBR pile! I'm gonna need another bookcase soon! LOL! When I saw the name Petunia, I knew it was a got!! HAD to be!! Darn autocorrect! Lets try hat again. I'm really looking forward to reading this. Thank you for the summer reding giveaways! Petunia is such a pretty name, looks like a fun book to read for the summer!